This plant is very popular among those seeking a "legal high" and the mildly narcotic seeds are often mixed with tobacco or other herbs in smoking mixtures. However, most content themselves to growing the plant for its attractive flowers in native habitat gardens. Like other members of the poppy family, the prickly poppy has a long history as a traditional medicine. Argemone - Prickly Poppy Side Effects: A. mexicana seeds contain 22�36% of a pale yellow non-edible oil, called argemone oil or katkar oil, which contains the toxic alkaloids sanguinarine and dihydrosanguinarine. Flowers/Fruit/Seeds:Large yellow, or rarely white flowers. 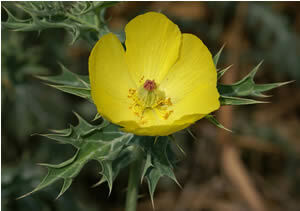 A related species, rose or spiny prickly poppy (Argemone sanguinea), has white, lavender, or purple flowers. Leaves & Stem:Erect branching stem, prickly bristled and furnished with a yellow, milky juice. Leaves are broadly lanceolate, spiny toothed, and blotched or striped with white along the principle veins. Singh, S.; Singh, T. D.; Singh, V. P.; Pandey, V. B. (February 2010). "Quaternary Alkaloids of Argemone mexicana". Pharmaceutical Biology 48 (2): 158�160. PMID 20645832.